National Day of the Republic of Serbia was celebrated February 16th at the Daley Center Plaza in Chicago. 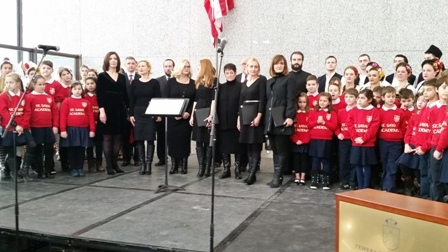 The celebration was organized by the Consulate General in cooperation with the city of Chicago, the Chicago Department of Cultural Events and the local Serbian community. The celebration began with the singing of the National Anthems of the United States and Serbia. During the singing of the national anthem of Serbia the flag of the Republic of Serbia was officially raised on the mast in front of the Daley Center Plaza. Acting Consul General addressed the present guests among which were the representatives of the US authorities, the Consular Corps, representatives of Serbian organizations and associations. In an hour long cultural-artistic program performers were: choir "Branko Radičević", students of the "St. Sava Academy" and folkloric ensembles "Soko" and "Dukati i Biseri". The celebration concluded with a joint performance of all participants in a rendition of the song "This is Serbia". Photos from the celebration at the Daley Center Plaza can be found here. 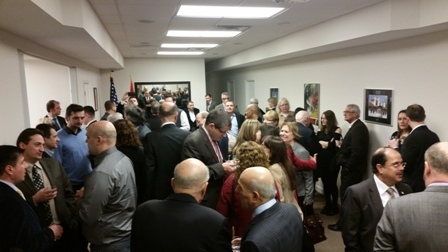 Also, on the occasion of the National Day of the Republic of Serbia the Consulate General held a reception which was attended by representatives of the State of Illinois, City of Chicago, members of the Consular Corps, Serbian community and many other guests. Following the playing of national anthems of the US and Serbia audience was addressed by Acting Consul General Dejan Radulovic. Representatives of the State of Illinois and City of Chicago also read the greetings of Governor Bruce Rauner, Mayor Rahm Emanuel and State Attorney Lisa Madigan. Gallery of photos from the reception can be found here.